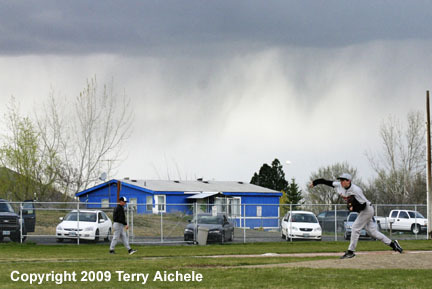 IRRIGON - The Irrigon Knights defeated the Sherman Huskies 9-7 in a storm shortened five inning game on Tuesday, April 14, 2009. 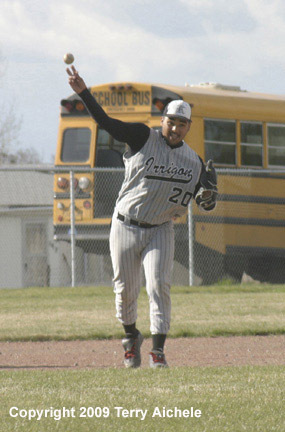 Irrigon scored first in the bottom of the first when Dustin Osborne hit a long shot into left field scoring Martin Garzilazo from second base. Two batters later McDaniel hit to center field bringing in Osborne giving Irrigon the 2-0 lead. The next scoring occured in the bottom of the third when Osborne scored on a grounder by Eleazar Vera. Then Cesar Cardenas drove in McDaniel on shot down the firstbase line. Then Mike Oliver drove in Cardenas on a grounder to third base. Those runs gave Irrigon the 5-0 lead. 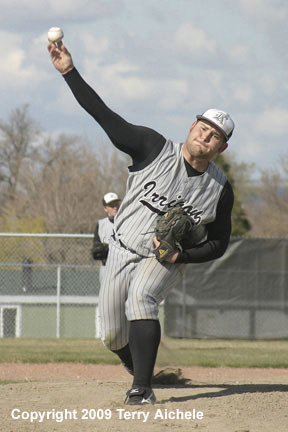 Irrigon's starting pitcher hit a rough patch in the top of the fourth inning as Sherman began to connecting on his throws. 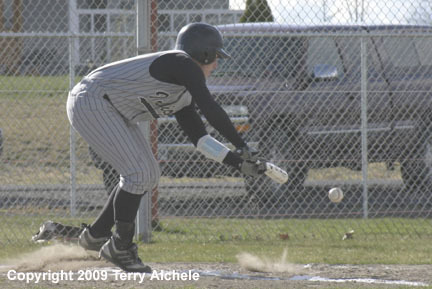 Sherman scored four runs, had two on base and only one out when Irrigon's starter McDaniel was switched for Osborne. 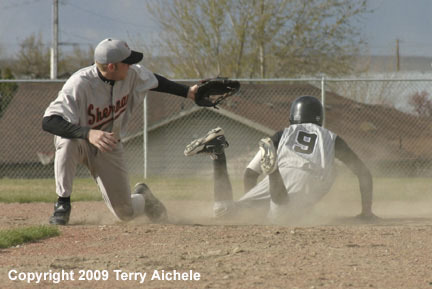 Sherman scored two more before Irrigon got the third out. Those runs gave Sherman the 6-5 lead. Irrigon came right back in the bottom of the fourth with Giles Ellet scoring on a hit by Jesus Munoz to tie it up at 6-6. 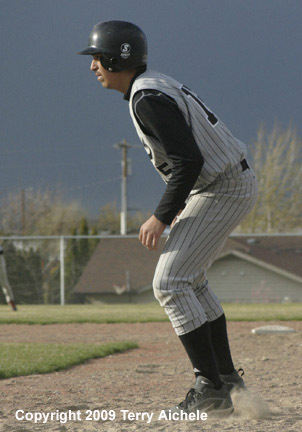 Irrigon had the bases loaded when Sean Burrows was walked bringing in McDaniel from third. The Mike Oliver hit a long ball to right field bringing in Vera and Cesar Cardenas and giving Irrigon the 9-6 lead. In the top of the fifth inning Sherman was able to get a runner on base and worked him around to score closing the gap to 7-9. 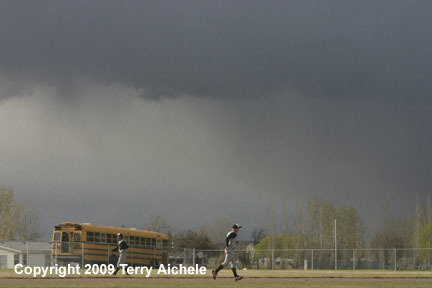 At the halfway point of the inning the umpires got together an discussed the storm that was gathering. They talked about keeping an eye out for lightning. 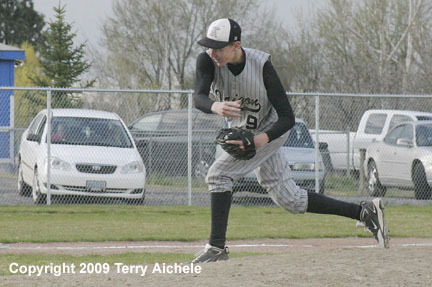 The bottom of the fifth had Irrigon going three up and three down ground outs and a strikeout. The umpires gathered the coaches at the mound before the top of the sixth and called the game. At least one flash of lightning and rumble of thunder came from the north, probably just on the Washington of the Columbia River. The teams and fans quickly picked things up and headed to safer locations. 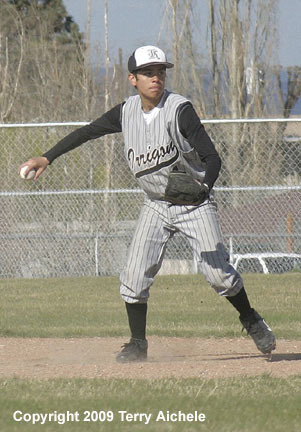 Irrigon won 9-7.